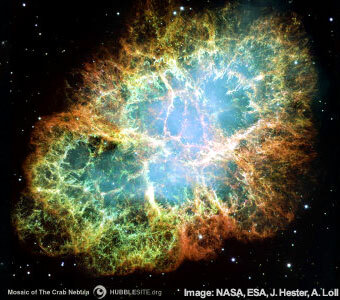 The Crab Nebula is the cloud of debris from a supernova (exploding star) observed by humans in 1054. At the center of this cloud is a pulsar (a kind of neutron star) that is the remains of the star that exploded). Both supernova explosions and pulsars are potential sources of gravitational waves. Throughout history, humans have mainly relied on different forms of light to observe the universe. Today, we are on the edge of a new frontier in astronomy: gravitational wave astronomy. Gravitational waves carry information on the motions of objects in the universe. Since the universe was transparent to gravity moments after the Big Bang and long before light, gravitational waves will allow us to observe further back into the history of the universe than ever before. And since gravitational waves are not absorbed or reflected by the matter in the rest of the universe, we will be able to see them in the form in which they were created. Moreover, we will effectively be able to “see through” objects between Earth and the gravitational wave source. Most importantly, gravitational waves hold the potential of the unknown. Every time humans have opened new “eyes” on the universe, we have discovered something unexpected that revolutionized how we saw the universe and our place within it. Today, with the United States’ gravitational wave detector (LIGO) and its international partners, we are preparing to see the universe with a new set of eyes that do not depend on light.